Palmetto Publishing Group, 9781641110730, 362pp. Newly retired publishing executive, Theo Phillips, and his wife, Liddy, decide to leave the shadows of Atlanta behind and return to their South Georgia roots in time-lost Shiloh. While making new friends, Theo's interest in a memorial launches him smack dab in the middle of scandal and dark secrets. As Theo digs deeper into the mysterious fire that stole the town's landmark courthouse and a town hero, he and Liddy's retirement dreams take a turn that could unravel both them and the idyllic life they and many others look for in Shiloh. T. M. Brown is a Southern boy at heart, although he's lived and traveled in many states far removed from his beloved boyhood roots in Georgia and Florida. He returned to his Southern roots several years ago while his two sons were still in school and regularly traveled throughout the South before returning to college shortly after his youngest son graduated. In the last fifteen years he has preached, taught and coached in Alabama, Georgia and Florida until his wife and he moved outside of Atlanta and retired to write, travel, and spoil grandchildren. An excellent mystery novel! 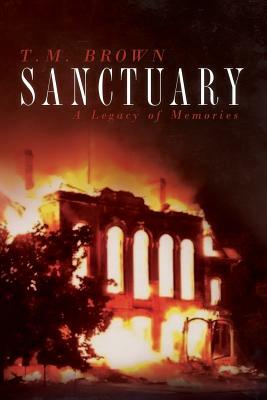 Anyone who enjoys reading suspense novels, in particular ones that take place in the South, will find Sanctuary an extremely good read. Pack your bags and get ready to take a trip back in time to small-town America... You don't want to miss this adventure. It was difficult to say goodbye to the colorful cast of characters who reside in the tight-knit, small town of Shiloh. Luckily this is the first book of what will hopefully be a long series. Dana Ridenour, award-winning author of "Behind the Mask" and "Beyond the Cabin"